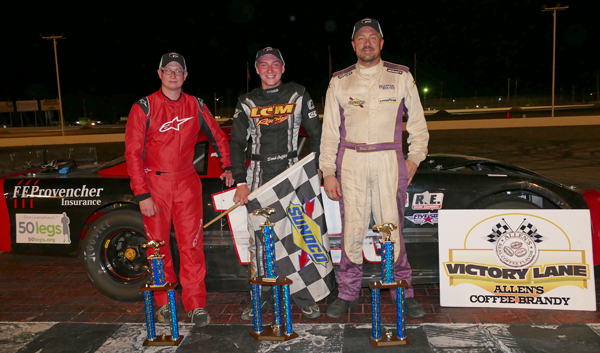 Oxford, Maine - Derek Griffith of Hudson, New Hampshire raced to his first-ever Oxford Plains Speedway victory in the 50-lap Super Late Model feature, topping the Budweiser Championship Series racing card on Ferris Mowers Night presented by Dave's Small Engines Saturday night. Griffith's victory aboard the LCM Racing 12 came from third starting position, but was no cakewalk, as reigning HP Hood Oxford 250 champion Glen Luce of Turner and others had restart chances but could not prevail against the 19-year-old hotshoe. Griffith becomes the 13th winner in 13 races this season for the Budweiser Super Late Models. Luce looked like a contender to be the first repeat winner in the top class this season, but settled for runner-up honors. Former track champion Shawn Martin of Turner raced to an impressive third-place finish after starting the race in 20th position. Rookie Josh Childs started from the pole, battled Griffith for a spell en route to a fourth-place finish. Reigning track champion and current points leader Timmy Brackett of Buckfield rounded out the top five after starting 18th. Matt Dufault of Turner returned to victory lane, tightening an already-close championship battle against fellow Turner racer Calvin Rose, Jr. in the Allen's Coffee Flavored Brandy Street Stock division. Dufault started seventh and was soon stalking early race leader Matt Williams of Brownfield. Rose, the 11th starter, patiently moved into contention as Dufault took command, just moving to second a straightaway behind Dufault. But unlike the previous week, Rose was unable to prevail on the restart, and Dufault was triumphant in the 30-lap race. Rose settled for runner-up honors, with Lisbon's Rick Spaulding claiming third-place hardware. Early race leader Williams, of Brownfield, was fourth under the checkered flag in his first appearance of the season. Zach Emerson of Sabattus was fifth. 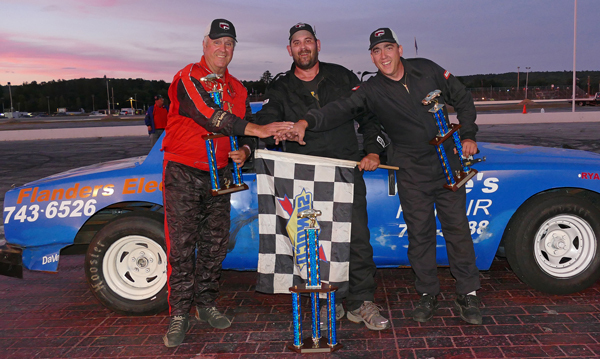 Jamie Heath of Waterford prevailed in another entertaining 20-lap feature race for MacDonald Motors of Bridgton Bandits racers. After gaining eight spots on the first lap from his 14th starting position, Heath was off chasing early leader Charlie Hall of Oxford. Heath got by Hall on a restart and went on to claim yet another checkered flag in his impressive OPS portfolio. Hall was clearly the best of the rest on this night, claiming runner-up honors well in front of third-place Tyler Green of Turner. Green, who led the championship standings entering the night but lost that lead to Heath, survived a tough battle for the final trophy with Ryan Hewins of Leeds, in the Varney ride. Bill Grover of Waterford rounded out the top five. 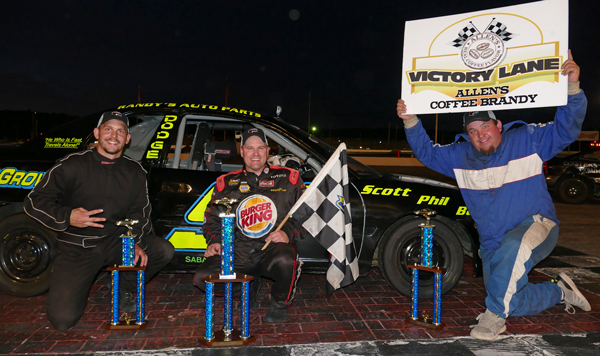 Kyle Kilgore of South Paris nailed down his second win of the season in the 15-lap Dave's Small Engines/Ariens/Gravely Figure 8 race, noting in victory lane that all three 100-race winners in the history of Oxford Plains Speedway were in the race. Kilgore took the lead from Mike Rowe, who looked like he might triumph in his first-ever run through the X. But an errant lapped car took Rowe wide and opened the door for Kilgore, who sped to victory in one of the most action-packed races to date for the class. New England Hall of Famer Rowe, of Turner, did claim runner-up honors in front of Eric Hodgkins of Minot, who somehow claimed a third-place finish after a head-on bout with a concrete barrier. Greg Durgin of South Paris and Lisbon's Robert Morey rounded out the top five. Super Late Model competition resumes Sunday, July 31 at 6:00 p.m. with the HP Hood 150 for Pro All Stars Series. PASS Mods and Legends Cars round out that racing card. The Budweiser Championship Series at Oxford Plains Speedway resumes on Saturday, August 6 at 7:00 p.m. For more information visit oxfordplains.com or call (207) 539-8865. Unofficial Budweiser Championship Series results from Ferris Mowers Night at Oxford Plains Speedway on Saturday, July 30 showing finishing position, car number, driver's name, driver's hometown. SUPER LATE MODEL (50 laps) 1 12 Derek Griffith, Hudson, NH; 2 7 Glen Luce, Turner; 3 94 Shawn Martin, Turner; 4 3 Josh Childs, Oxford; 5 60 Tim Brackett, Buckfield; 6 75 Gary Smith, Bangor; 7 24 Gunnar Rowe, Turner; 8 25 Shawn Knight, Turner; 9 46 Dennis Spencer, Jr., Oxford; 10 36 Scott Robbins, Dixfield; 11 03 Scott Moore, Anson; 12 72 Chris Coolidge, Norway; 13 54 Ryan Deane, Winterport; 14 88 Kyle DeSouza, Fairhaven, MA; 15 53 Alan Wilson, Hebron; 16 23 Lonnie Sommerville, Burnsville, NB; 17 0 Spencer Morse, Waterford; 18 9 JT Thurlow, Windham; 19 61 TJ Brackett, Buckfield; 20 24 Mike Rowe, Turner; 21 47 Kelly Moore, Scarborough. Allen's Coffee Flavored Brandy STREET STOCK (30 laps) 1 61 Matt Dufault, Turner; 2 8 Calvin Rose, Jr., Turner; 3 36 Richard Spaulding, Lisbon; 4 63 Matt Williams, Brownfield; 5 23 Zach Emerson, Sabattus; 6 24 Jonathan Emerson, Sabattus; 7 58 David Whittier, West Poland; 8 60 Richard Wentworth, Center Conway, NH; 9 4 Jordan Russell, Norway; 10 30 Don Duval, Leeds; 11 77 Bryce Mains, Naples; 12 42 Kim Tripp, Oxford. MacDonald Motors of Bridgton BANDITS (20 laps) 1 91 Jamie Heath, Waterford; 2 3 Charlie Hall, Oxford; 3 26 Tyler Green, Turner; 4 51 Kyle Hewins, Leeds; 5 13 Bill Grover, Waterford; 6 18 Brian Hiscock, Turner; 7 4 Caleb Emerson-Mains, New Gloucester; 8 08 Mike McKinney, Berlin, NH; 9 5 Guy Childs, Sr., Sabattus; 10 77 Rob Crepeau, Minot; 11 54 Dustin Salley, Poland; 12 19 Chris Foster, Lisbon; 13 14 Adam O'Neil, Lewiston; 14 33 Matt Hiscock, Turner; 15 20 Darryl Quinlan, Westbrook; 16 00 Mike Neddenreip, Bridgton; 17 88 Nick Hoyt, Litchfield; 18 2 Shaun Hinkley, Oxford; 19 8 Joshua Knoll, Mechanic Falls; 20 15 Chris Smith, Norway. Ariens / Gravely / Dave's Small Engines FIGURE 8 (15 laps) 1 4 Kyle Kilgore, South Paris; 2 127 Mike Rowe, Turner; 3 97 Eric Hodgkins, Minot; 4 41 Greg Durgin, South Paris; 5 3 Robert Morey, Lisbon; 6 2 Dale Lawrence, Lisbon Falls; 7 28 J. Varney, Leeds; 8 39 Gale Williams, Sumner; 9 54 David Smith, South Paris; 10 27 Jon Lizotte, Lewiston.